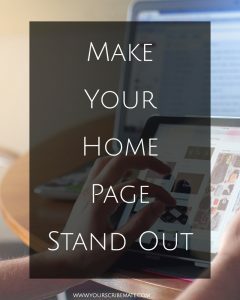 Your home page is the first thing visitors to your site will see. It’s the first chance you have to make an impression, to show them what you’re all about. You want it to be welcoming, to let your readers know you’re glad they stopped by. Give them a reason to go further into your site and look around. If you’re going to include a headshot on the home page, it should be professional. See my previous post for some tips to make it great. Once you have that taken care, you need to create a great looking banner or header. Check out romance writer Erin Nicholas for an example of one that looks really good. It features her name (seems basic, but you wouldn’t believe how many authors don’t put it in their header), it tells you some of her accomplishments, like being a USA Today and New York Times best seller, a few quote blurbs from other romance authors, and images from her most recent books. There’s no way anyone would look at that header and not know that she’s a romance writer whose latest series is small-town romance. Another great banner, and something completely different, is fantasy author Jim Butcher. His header is simply his name and a piece of art representing Harry Dresden, the main character from his most popular series. Here, too, even without pictures or titles of his books in the header, anyone visiting his page could guess he writes fantasy books. Next up on your home page – you want to include the covers of your latest books. Ideally, just the latest books, not your entire backlist. If you do have more than one of your books showing on your home page, keep them in reverse chronological order so that the latest one is always one top. And make sure to include buy links to as many retailers as you can – Amazon, Barnes & Noble, iBooks, Books-A-Million, as many as possible. Your home page should also include a place where your readers can sign up for your newsletter. You do have a newsletter, don’t you? And, as I mentioned in my previous post, your social media links should be on every page, including your home page. Even with these guidelines, there’s a lot of room to make your home page look like whatever you want it to. To make it reflect you and your work as much as possible. The ones I mentioned earlier, Erin Nicholas and Jim Butcher, work so well, not only because they incorporate these elements, but also because it’s easy to see from their home pages exactly what kind of books they write.